A 6.1% interest rate is not reasonable at all. The real reason interest rates are so usuriously high is so that graduates who end up doing really well will be subsidising the three quarters who never fully repay their debt. For all the arcane public accounting methods the basic sums are simple enough. The more that is paid back by all graduates, rich and poor, the less it costs in annual government spend. Charging higher-earning graduates more – and even much more – than the economic cost of their debt has been a clear policy decision. Effectively the government have applied a tax accelerator to higher earning graduates who will already be paying tax at higher rates. So those between earnings of £100,000 and £123,000 will be paying 71% marginal tax (40% higher rate tax + reduction in personal allowance + National Insurance + 9% student debt repayment). Once again, the highest tax rate in the world, beating even Finland and Denmark. However, the pain does not stop there. Anyone staying at these earning levels will be paying 71% tax for longer to pay for a higher debt that has been racking up at 6.1% – or more if RPI goes up or the government changes the rate. So when planning your working life, avoid a sudden big hike in earnings towards the end of the 30 years of your loan because you won’t be seeing much of what you earn. Take a sabbatical in the two years or so before your loan is written off, for example. Here is yet another example of how a bolt-on tax system designed to pay for higher education creates unsustainable distortions that can end up damaging the economy. If the reason for such high interest rates is to maximise the contribution of successful earners to compensate for others, the personal cost extends to all graduates with loans, even those with no hope of paying their loans off. This of course is the emotional burden of knowing you are in so much increasing debt that will be with you for 30 years and impact your ability to get credit including a mortgage. Graduates and prospective graduates are told not to worry about the level of debt increasing so quickly. 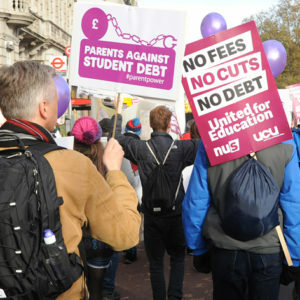 But once again we never hear that from anyone actually burdened with £57,000 of student debt.